NEW YORK, NY — February 14, 2017 — Penguin Random House introduces #UnitedStatesOfBooks, a new social initiative and ReadDown book list series that celebrates, on Instagram and penguinrandomhouse.com, the literary spirit of each of the 50 states. 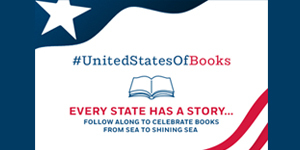 #UnitedStatesOfBooks takes readers on a literary tour state by state, with dedicated Instagram posts that highlight a book set in each state, paired with an object that is representative of the state. Curated ReadDown book lists will offer additional reading recommendations for each state. Penguin Random House, the world’s largest trade book publisher, is dedicated to its mission of nourishing a universal passion for reading by connecting authors and their writing with readers everywhere. The company, which employs more than 10,000 people globally, was formed on July 1, 2013, by Bertelsmann and Pearson, who own 53 percent and 47 percent, respectively. With nearly 250 independent imprints and brands on five continents, Penguin Random House comprises adult and children’s fiction and nonfiction print and digital English- and Spanish-language trade book publishing businesses in more than 20 countries worldwide. With over 15,000 new titles, and close to 800 million print, audio and eBooks sold annually, Penguin Random House’s publishing lists include more than 60 Nobel Prize laureates and hundreds of the world’s most widely read authors.